Welcome! Gaillardia Apricot Honey is a fabulous new perennial bred by Rosy Hardy of Hardy’s Cottage Garden Plants. It is being launched at the Royal Horticultural Society’s Chelsea Flower Show 2018. Gaillardia Apricot Honey is the product of many years of careful breeding and selection by Rosy Hardy. Rosy is an accomplished plantswoman and nursery owner from Hardy’s Cottage Garden Plants in Hampshire, England. Rosy has already launched many new plant varieties, including several varieties of Gaura and the successful Gaillardia St. Clements (Oranges and Lemons). She has a reputation for developing excellent garden plants that work well in traditional cottage style gardens as well as in modern garden situations. Gaillardia Apricot Honey is being launched at the Royal Horticultural Society’s Chelsea Flower Show 2018 by Hardy’s Cottage Garden Plants. Rosy is the most successful female exhibitor in the history of Chelsea – she and her team have won 21 gold medals for exhibits at the show. 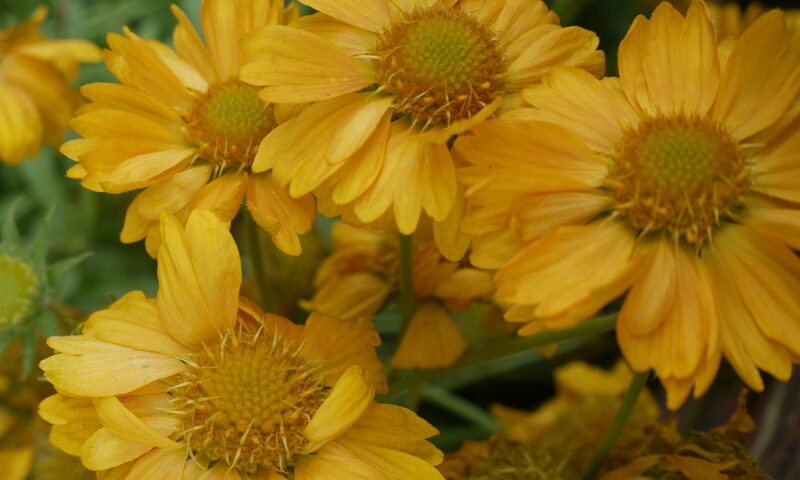 Gaillardia Apricot Honey is a hardy perennial that needs to be planted in a sunny spot in fertile soil. Apricot honey produces large soft honey coloured daisy flowers all summer, from May until frost. It grows to around 70cm high by 80cm wide when mature. It is a herbaceous perennial – this means that it dies back to ground level in the winter and grows again in the spring. Apricot Honey is perfect for a border or it can be grown in a large container. It is also really popular with bees, so give our pollinator friends a hand by planting one in your garden! Hardy’s Cottage Garden Plants will be launching Gaillardia Apricot Honey at the Royal Horticultural Society’s Chelsea Flower Show 2018 on Monday 22nd May. Look out for Apricot Honey on the TV, in newspapers and magazines! You might just see a bee visiting! Website by Plants For Europe Limited. Plants For Europe Limited is an independent plant breeders’ agent, representing the finest plants from breeders worldwide.